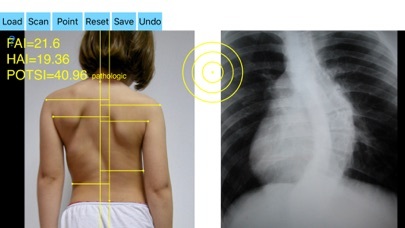 By visual inspection of the spine, asymmetry of the back is significant enough to suspect the existence of scoliosis in such cases, to evaluate spinal deformity an X-ray is ordered. Scoliometers could help evaluate the appearance of an asymmetric spine deformity with variable sensitivity and specificity but cannot substitute radiography. It is widely reported in the literature that significant correlations between radiographs and topographic parameters were found. 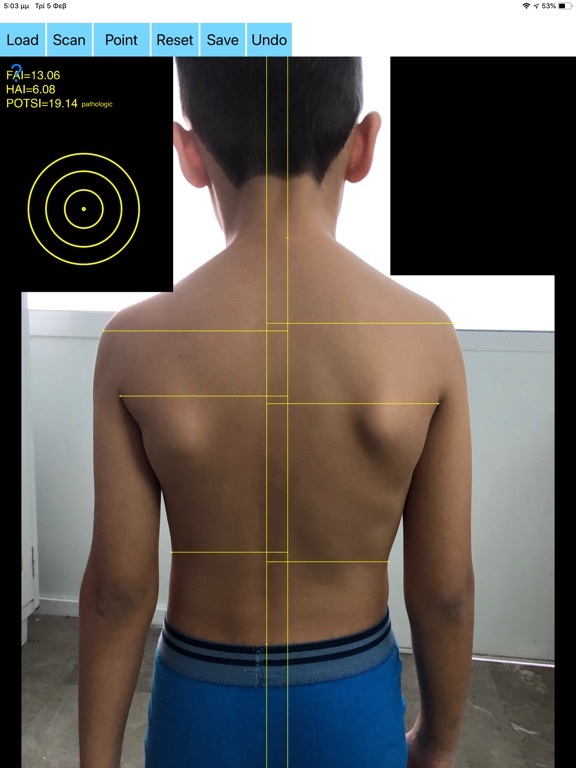 Posterior Trunk Symmetry Index (POTSI) is a useful Index in the assessment of spinal deformity. POTSI Index is very sensitive in revealing any frontal plane asymmetry and could help identify moderate deformities which might otherwise be missed in clinics or physical examination. The Potsi Index is the sum two variables Height Asymmetry Index (HAI) and Frontal Asymmetry Index (FAI). Height asymmetry indexes are obtained as the sum of height differences of the shoulders, axillary folds, and waist creases, and it is normalized with the division of its value by the vertical distance from the C7 vertebra to the baseline of the gluteal cleft. 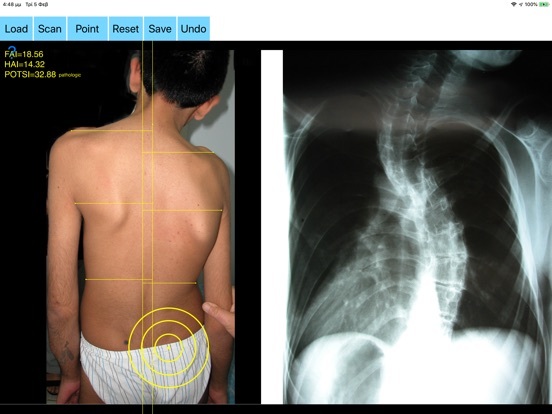 The Potsi App calculates the Potsi Index according to the above mentioned developed topographic method (Suzuki N, Inami ) and offers a way to evaluate external back deformities with noninvasive technique. It is inexpensive and can be repeated indefinite times thus reducing unnecessary x-rays for normal anatomies and mild cases. The app helps the doctor in an outpatient setting to measure all the indexes in a blink of the eye by clicking few points. 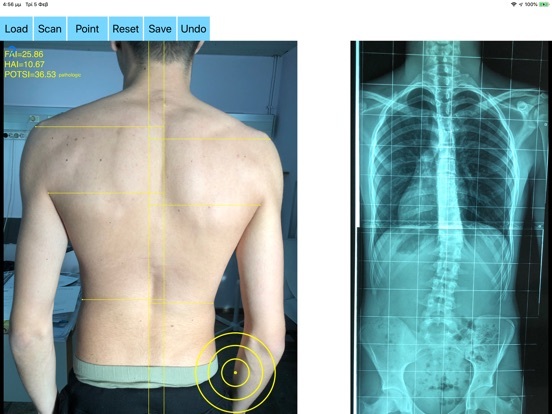 -by marking certain multiple anatomical points over the patients back the app can evaluate back’s symmetry in a few seconds. 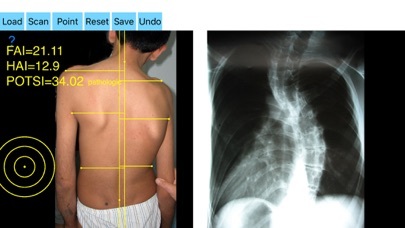 Eight specific points at the surface of the patient’s back are required. POTSI is relatively simple to measure, even on regular photography of the back. Ideal POTSI is zero, meaning full symmetry of the back surface. The App calculates all necessary elaborate formulas and after analysis the posterior trunk symmetry index(POTSI) is printed (normal value <10). -Save the planned images, for later review or consultation. In a busy everyday practice, measuring all these parameters needed to calculate the Index by the classic way is time consuming and cumbersome. Additional expensive equipment is not needed. Back surface topography by means of structured light in the screening is not needed to mark the necessary points for calculating the Potsi Index. Simple back images taken by phone camera are sufficient. The app offers a very convenient and accurate way to perform measurements. 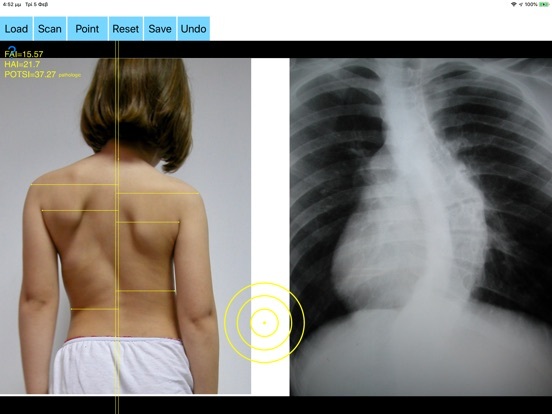 The app could help to monitor objectively the course and evaluate optimally spine deformities. This App is particularly useful especially in clinical settings where you need a quick results without losing time. For specialist a useful tool to monitor quantitatively the cosmetic defect during clinical sessions and to objectively evaluate the effects of surgery on trunk shape. All information received from the software output must be clinically reviewed regarding its plausibility before patient treatment! The App is indicated for assisting healthcare professionals. Clinical judgment and experience are required to properly use the software. The software is not for primary image interpretation. 1. 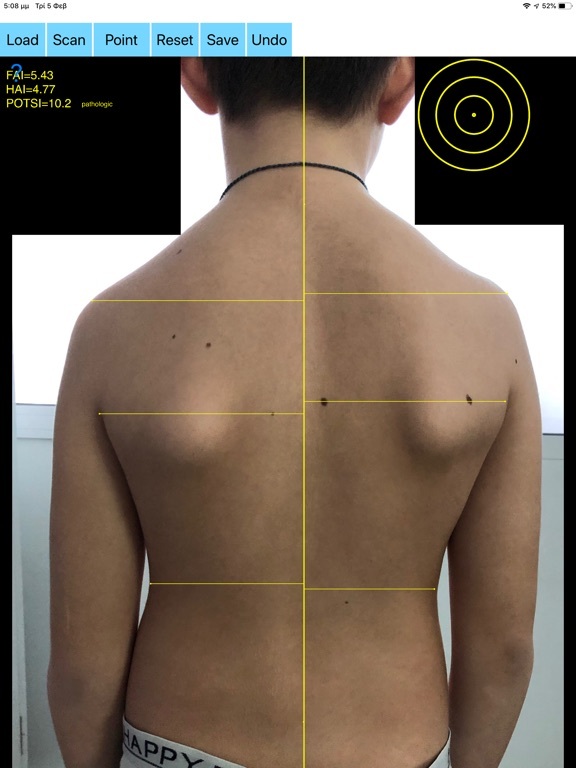 Pino-Almero L1, Mínguez-Rey MF, Rodríguez-Martínez D, Cibrián-Ortiz de Anda RM, Salvador-Palmer MR, Sentamans-Segarra S. Clinical application of back surface topography by means of structured light in the screening of idiopathic scoliosis. J Pediatr Orthop B. 2017 Jan;26(1):64-72. 2. Suzuki N, Inami K, Ono T, Kohno K, Asher MA. 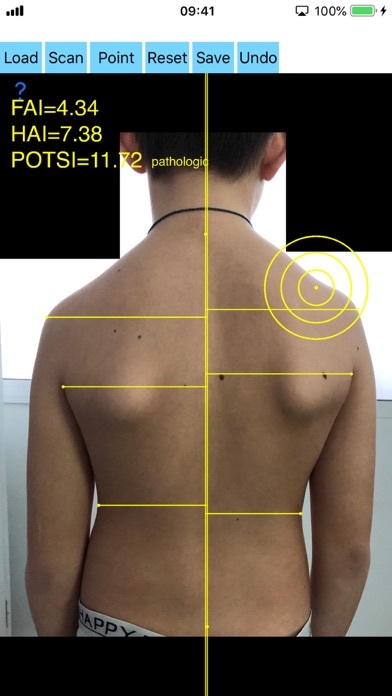 Analysis of posterior trunk symmetry index(POTSI) in scoliosis, part 1. Stud Health Technol Inform 1999, 59:81-84.